Presidential with confirmation of Chief Justice of India and Governor of respective state. ↑ "Madras High Court". BSNL. ശേഖരിച്ചത്: 2 March 2012. 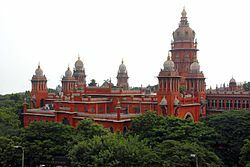 ↑ "History of Madras High Court". Madras High Court. ശേഖരിച്ചത്: 25 April 2014. ഈ താൾ അവസാനം തിരുത്തപ്പെട്ടത്: 14:46, 19 ജൂലൈ 2018.